(Ed note, I think I only have run-on sentences). 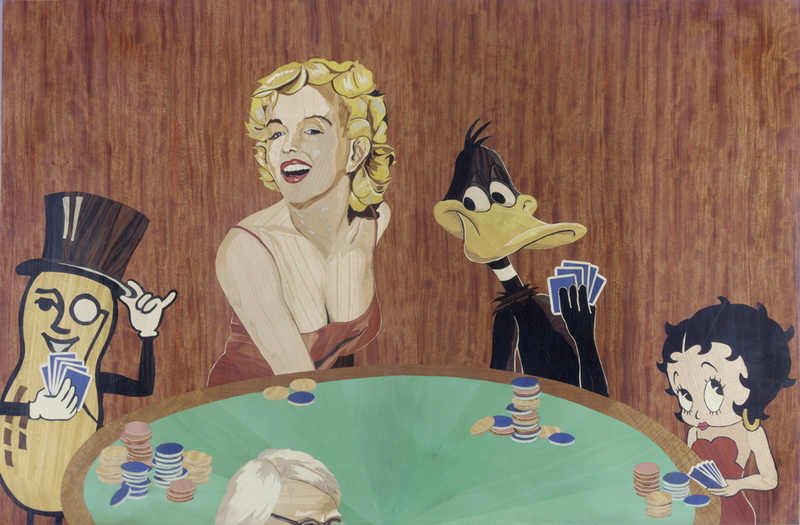 I have always loved the anonymous painting, Dogs Playing Poker and so I especially love Silas Kopf‘s take on it in the below masterpiece, “I Think I Only Have A Pair”. It is yet too soon soon to tell if he will succumb to suggestive thought suggestion tactics administered by said muscle and present this piece to Gnome de Pluehm for his birthday bash tomorrow– which I am overseeing in this blog – but we can all only hold our breath and hop (typo, but I’m keeping it). It is a fine line between Pop Art and kitsch. When Pop first made its way into the art world in the late 1950’s many regarded the movement as kitsch, basically mundane without any real artistic content. What are we to think of an artist who reverses the order, taking kitsch and trying to make it Pop? This is the direction of Silas Kopf’s entry, I Think I Only Have A Pair, in the recent Salon de la Marqueterie Biennial in Marseilles.